A good rule of thumb when you buy or sell a stock is to make sure the commission fees don’t exceed 1% of the transaction. For example, if your broker charges $10 per transaction, and you buy $1000 of stock XYZ, you’re right at the 1% mark. When I first started buying stocks, I had no clue about this and I was buying quantities of $300, etc. I don’t think it’s necessarily a bad thing to exceed 1%, especially for more long term, safer (or boring) stocks, but it certainly shouldn’t become the norm. A lot of advisors will suggest putting your first $10,000 into an index fund or an ETF, but I’m against this unless you’re putting your money into an IRA or another conservative retirement account. Yes, index funds and ETFs are safer investments due to their diversity, but they’re not nearly intriguing enough to keep people interested in the market. But if you’re very worried about the market and how it will affect you, you might be interested in something called ‘The Permanent Portfolio’. This is something a friend of mine mentioned to me once, and I will have to leave it up to you to investigate the details. The fund’s name is PRPFX, and it invests equally among a diverse range of stocks, bonds, and commodities. Frankly, it’s far too conservative considering how actively I check my own stocks. I mean, if you put a bunch of your money into some stocks, wouldn’t you be curious to see how it’s doing? Putting money into a really boring, safe location doesn’t create enough of a challenge for younger investors, so I always suggest individual stocks. And I’m not talking about stocks like Zynga, Facebook, or penny stocks. I’m talking about high quality, safe stocks like GE, JNJ, KO, etc. An article just came out today about the price of gas, and it has me worried. The article states that gas has risen over the past three weeks. I’ve noticed there seems to be a creepy relationship between the price of gas and the Dow Jones Industrial Average. When gas prices go down, stocks go up. But, now, I’m worried. Not because I’m afraid all of my long positions will go sour, but because I also hold a few speculative stocks, and I enjoy trading these speculative stocks from time to time. Trading and investing are different, and it’s important to avoid trading (short term buy/sells) unless you have a lot of time and can keep a close watch on the stocks you buy. Also, an investing approach with dividend stocks is always the way to go if you’re putting some of your savings into the stock market and don’t need the money for awhile. But, then again, what do I know? Really though, there’s no way to time the market, and no matter how much the “experts” try to convince you how smart they are, NOBODY can time the market. Mr. Market has a reputation of taking investors on a bumpy ride that instills fear, driving them away from stocks and investing. With all the negative news generated regarding the instability in Europe, the poor job reports, and the chances of looming recessions, it’s no surprise that people avoid the stock market to keep their money in savings accounts and CDs. It makes sense to protect your money this way, but giving in to market-phobia can mean missing out on some big wins while losing out to future inflation. Investing in stocks can be risky, but it doesn’t need to be if you can take the time to invest in safer stocks. A general rule of thumb is that if you can withstand a potential downturn that lasts 5-10 years, then investing in the stock market should be a no-brainer. In most cases, it is even less risky than that! 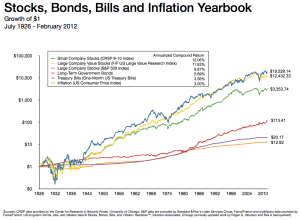 Here, let’s take a look at a common chart on stocks, bonds, bills and inflation. 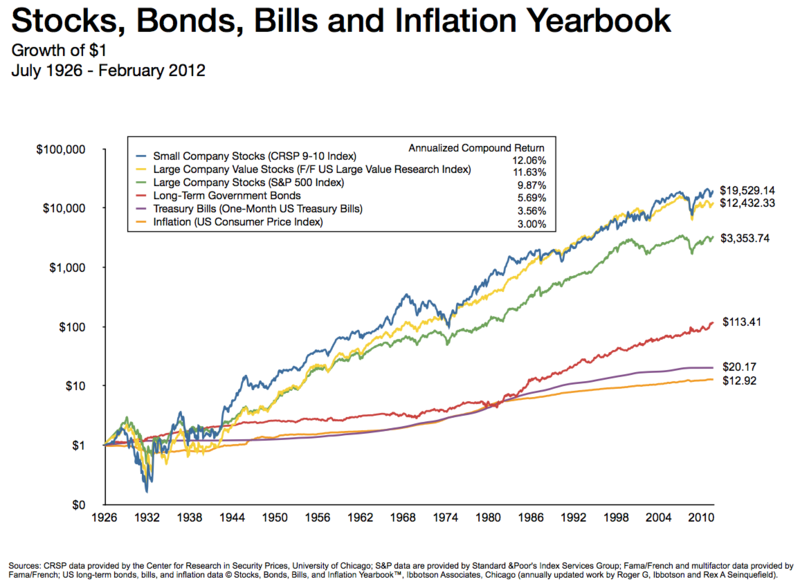 The chart shows 86 years of history where you can very easily observe an upward trend. There’s no guarantee that past performance will guarantee future returns. But as long as the population continues to grow and we have the natural resources to support the growth, the economy should follow. This will result in future inflation and positive growth in the stock market. But don’t take the advice from me, take it from the nation’s 400 richest people who have been using Mr. Market to make money from stocks all along. After deciding how much money to invest, the next step is to open an account with an online broker. You’ll most likely have a pretty good idea of what you’ll want to invest in by this point; Just make sure you’re not investing everything in 1 or 2 stocks, because I know some really smart friends and family members who sadly fell into this trap. It really changed their opinions of the stock market, too. There are literally thousands of articles on the internet related to picking safe stock investments, and it’s up to you on how much research you want to do. It really doesn’t take too much work. Just make sure to buy at least 5 stocks in different areas, and to check for consistent dividend payouts. And if you can get vested in a DRIP through a Roth IRA, you’ll be all set. Sound simple? I thought so. Now get started!